Momma Told Me: Give a gift that keeps on giving. Valentine's Day is almost upon us. I don't intend to solicit chaos and discount store riots, but the big day is less than a week off, and it's the women who have it hard on this one. Sure, men are easy enough to please, but when you've been with someone more than a few holidays you either ignore the date altogether or intend on making the occasion something extra special. And, while I could give you a dozen romantic ideas, one featuring a singing penguin telegram, the simple truth is, most of the people I care about can benefit from a good tech upgrade. Whether it's my father, boldly leaving behind his land-line for a much more affordable, and mobile, unlimited talk, text, and data plan- or Jay and his year-long campaign for a new smartphone with reliable service. 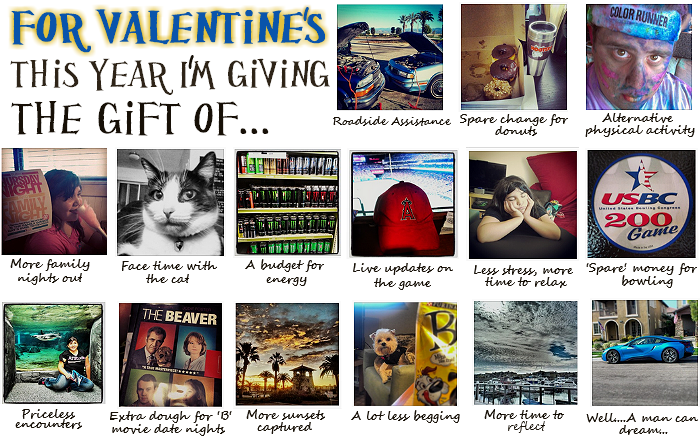 This year, when the calendar hit February, I immediately knew I wanted to give a Valentine's gift that would have a positive impact all year round. In our household, with Christmas in December, Valentine's in February, and Jay's birthday in April, it seems like there are several months spent campaigning for gifts. Men can be fickle creatures to shop for; they always seem intent on brushing off holidays as if they could go with or without. But it's hard to deny the, sometimes less than subtle, messages they casually drop between cuddles and in front of mutual friends. 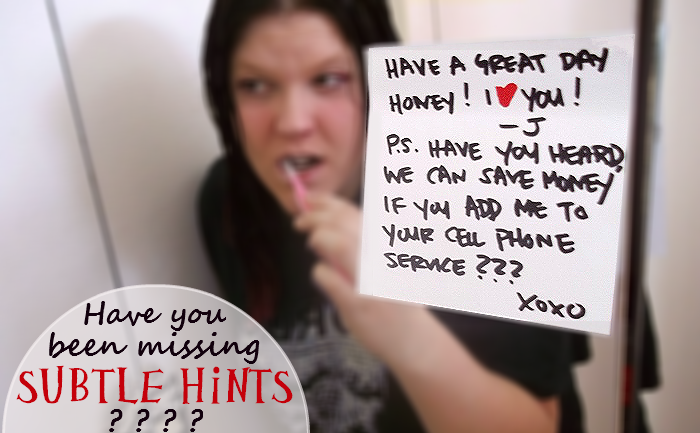 Do you have a Valentine that's interested in tech and trying to save a few pennies? If so, then Jay just might be onto something big with his demand for a new contract free cell phone. When it comes to couples, especially those that live together, it can be a big step to combine cellular service, as well as a practical one. As Jay's excessive loving notes have indicated over the past few months, adding him onto my Walmart #FamilyMobile plan as an additional line could not only be more affordable for us both, but might allow us to connect more through a shared service. As a general rule I feel buying electronics for loved ones can be dubious. Who wants to invest in that Man Cave TV and take away quality relationship time throughout the year? But Jay made several good arguments towards upgrading his old phone and combining our service. More often than not lately I've awoken to hand drawn re-imaginings of the sunrise attached to a sentiment about poor network service. His cell phone provider has even been notorious for not processing auto-payments and shutting down his phone all-together. If you've ever stood in front of the discount theater in a dress and heels waiting for your sweetie to show up a half an hour late- you know the damage a poor data connection can have on a relationship! 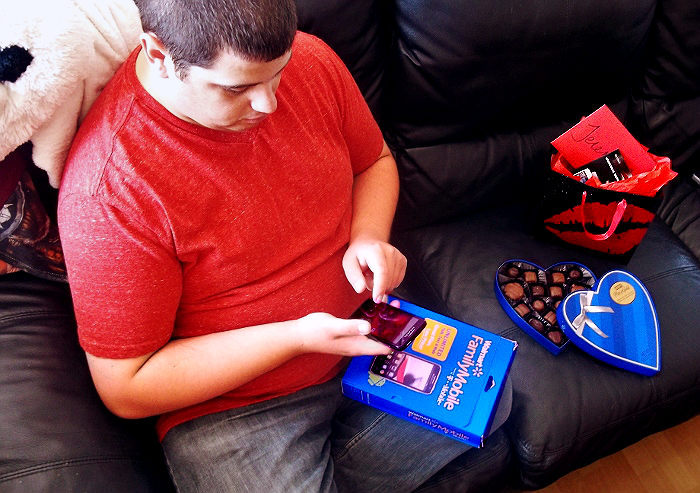 So, this year I broke my 'no technology' gift rule, and headed into my local Walmart to look into the potential of upgrading Jay's cell service and phone for a Valentine's gift. 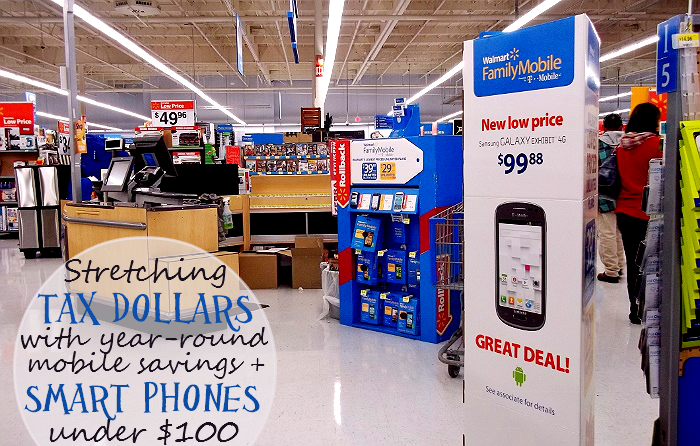 I didn't receive a large tax refund this year but I knew one could easily #MaxYourTax with the wide variety of smartphones under $100 on the Walmart #FamilyMobile plan. There were several great models to shop, and even explore, before buying at the wireless center. It didn't take long for the recently price-dropped one-touch Evolve smartphone to catch my eye at just $79. With the $25 Activation Kit I was also not only gifting a new smartphone, but providing a $25 credit towards the first month of service, all for just over $100 out the door. And, by activating Jay's new line on my existing account, he'd be paying just $35 for one of the lowest priced unlimited plans around. Normally I'd worry about the cheapest wireless plans having the potential for service and speed issues, but I know from experience I can count on the coverage in our areas. Not only is there an easy to search coverage map customers can fit their service with online, but I can instantly manage all of my Family Mobile accounts online, or directly through our smartphone devices. No more billing errors, and missed calls on the old network! And, because our home and surrounding work area are in the 'Excellent' coverage zone for service, I can rest assured I won't be getting any more hand drawn photo texts. 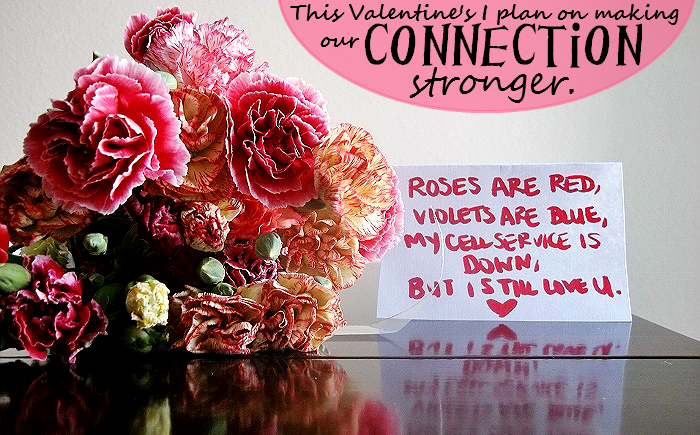 What Daughter Says: Why not spoil your sweetie with a gift that will save and help you connect all year round? What a fun and great idea on what to give for gifts! That's such a great price, plus it's a super gift idea. @Cassie, Some stores seem to have an entire room dedicated to a mobile department! If you have issues locating them, feel free to ask an associate in the electronics department to assist you. When I bought my first phone it was woven in with the other prepaids and I had to ask for assistance to answer my questions. You can also shop for your #FamilyMobile needs online! Phenomenal post. 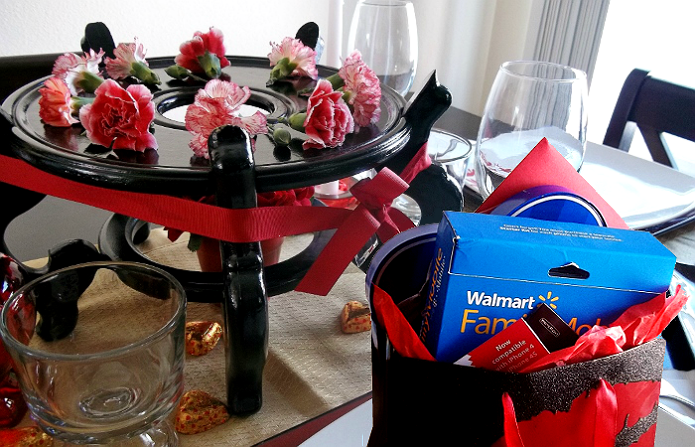 You really helped me understand the value of this Walmart plan as a Valentine gift! The pictures were highly entertaining and quite possibly the best I have ever seen! How sweet i love the subtle hints ;) I have to check out walmarts phone selection I just may have to treat myself with one! Glad you picked up on those "hints". Purchasing a gift that can give back year round seems like a great way to use a refund! I have curious about WalMart phone plans and service. They seems to be pretty affordable and my husband needs a new phone. His birthday is around the corner was I will keep this in mind. Thanks for sharing. I am looking for an affordable cell phone service. I will check them out. Thanks! 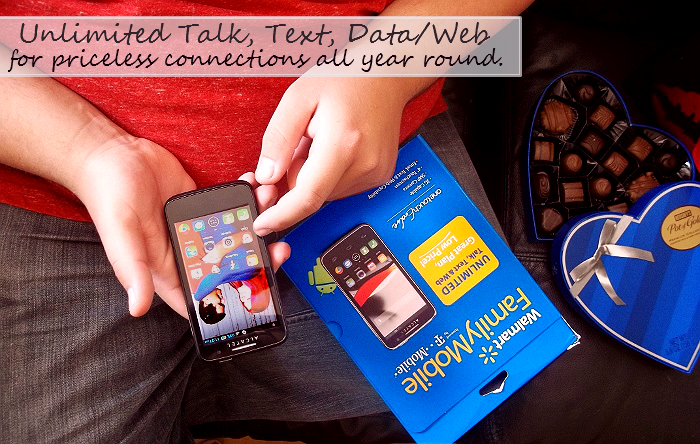 That is a great gift and it's so hard to find affordable and dependable cell service. Thanks for the great info. I actually happen to have a friend in need of service, I'll share this post with her. Thanks for sharing. Sounds like a great service and the hone looks really nice. We are looking for new service and had wondered aboout WallMart! Looks like a good deal. I really need to get smart phone, I just didn't want to spend a lot of money. Thanks for the review. My husband's company just changed our health insurance provider and now we HAVE to go to Walmart in order to get discounts on our prescriptions... (neat trick huh?) so I'll probably be shopping there more often - and I will definitely check our their phones / electronics department. What a great gift! I love how affordable it is! 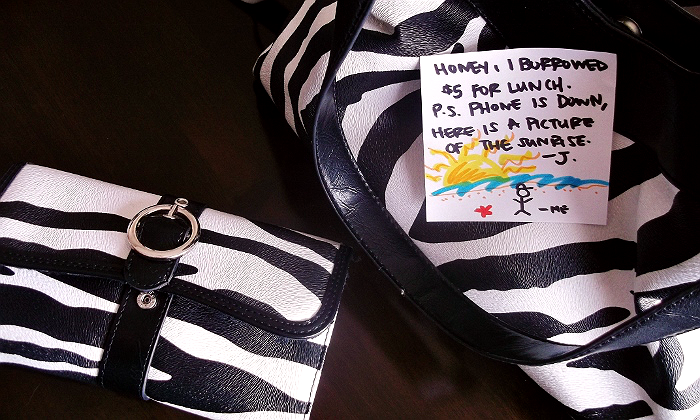 What a sweet gift! Any time! great deal! I am looking to get some sort of a family plan in the future now that my 12 yr old has been asking for her own phone, so I will have to check this out to see what is available in my area.